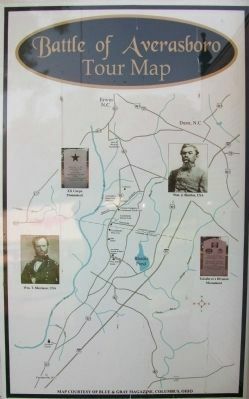 Photo collection of structures and terrain, and Civil War era diagram of the Averasboro battlegrounds. Pictures furnished by R.L. Hamilton; map research and drawn by R.L. Hamilton. John C. Smith home (Oak Grove) built in 1793, used as a Union Hospital in the Battle of Averasboro. William T. Smith home, built in 1834, used as a Union Hospital in the Battle of Averasboro. Farquhard Smith home (Lebanon) built in 1825, used as a Confederate Hospital in the Battle of Averasboro. Location: Old Raleigh and Fayetteville Hwy. Now Hwy 82, Harnett Co, NC. Chicora Cemetery, located on Averasboro Battleground on Old Raleigh and Fayetteville Hwy. In Harnett Co, NC 1865. Old Raleigh and Fayetteville Hwy roadbed, McAllister Millcreek (Bumpus Creek). Old Raleigh and Fayetteville Hwy, at Fishpond Branch. Old road leading to Joel Williams Mill on McAllister Millcreek (Bumpus Creek). Remains of Joel Williams mill on McAllister Millcreek (Bumpus Creek). Millstone from Joel Williams mill. 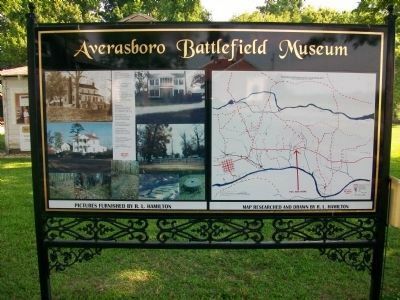 Averasboro battlefield tour map and directory. 15.985′ N, 78° 40.321′ W. Marker is near Dunn, North Carolina, in Harnett County. Marker is on State Highway 82 0.2 miles south of Arrowhead Road, on the left when traveling north. Touch for map. Marker is at or near this postal address: 3300 NC Highway 82, Dunn NC 28335, United States of America. Touch for directions. Other nearby markers. At least 8 other markers are within walking distance of this marker. 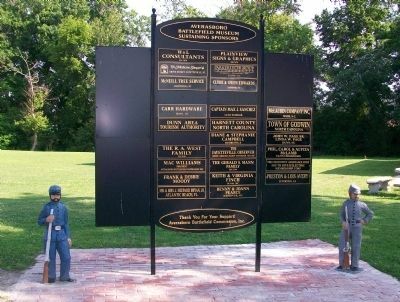 Battle of Averasboro (here, next to this marker); North Carolina (a few steps from this marker); Union Headquarters (approx. 0.2 miles away); Chicora Cemetery (approx. 0.2 miles away); Men of South Carolina (approx. 0.2 miles away); a different marker also named Battle of Averasboro (approx. 0.2 miles away); Confederate Soldiers of McLaws Division (approx. 0.2 miles away); South Carolina Troops at Battle of Averasboro, NC (approx. 0.2 miles away). Touch for a list and map of all markers in Dunn. Marker, period flag exhibit in background, and museum building. 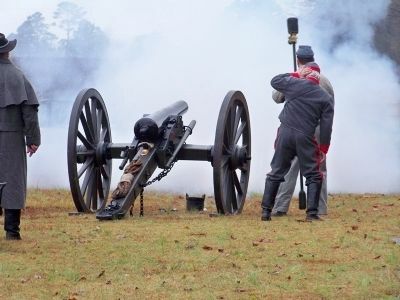 The Averasboro Battlefield Commission, Inc (ABCI) is tasked with the responsibility to preserve and present the story of the Battle of Averasboro, and lead in the preservation, presentation and promotion of the Averasboro Battlefield, Smithville Plantation and related history. 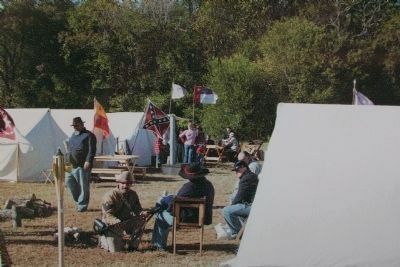 Living history cabin and reenactment field. 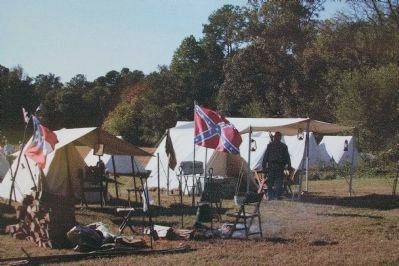 Each year, exciting events are happening at the Averasboro Battlefield and Museum. Although specific events and times differ from year to year, here are some of the wonderful and informative events hosted recently: Living History Event (living historians, reenactors, displays, presentations and demonstrations), Ghost Walk Tour, Horse and Pony Rides, Averasboro Fiber Festival (spinning, weaving, knitting, sheep shearing, working sheep dogs, and more), Battle Reenactment (tactics and demonstrations), Field Trips and Tours, Golf Benefit and Yard Sale. Local sponsors and corporate supporters. Battlefield reenactment event. 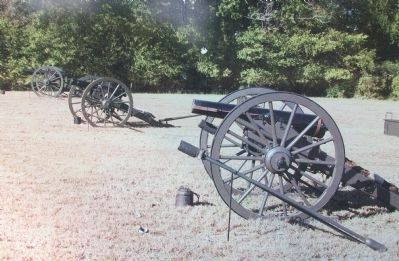 Edenton Bell Artillery Battery. 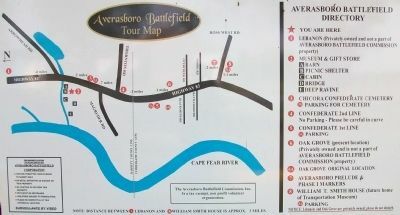 Battle of Averasboro Tour Map. 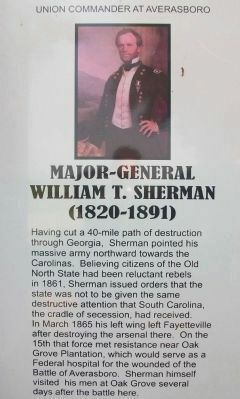 Major-General William T. Sherman (1820-1891). Major-General Jerrson Columbus Davis (1828-1879). 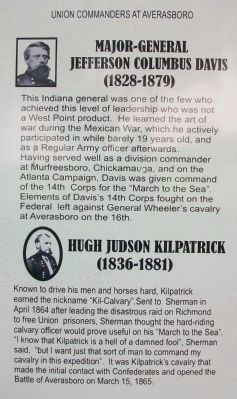 Hugh Judson Kilpatrick (1836-1881). Major-General Henry Warner Slocum (1827-1894). 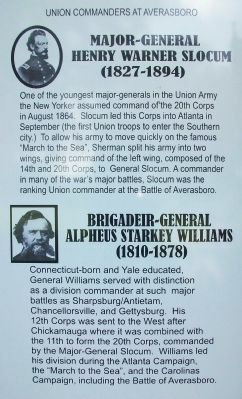 Brigadeir-General Alpheus Starkey Williams (1810-1878). 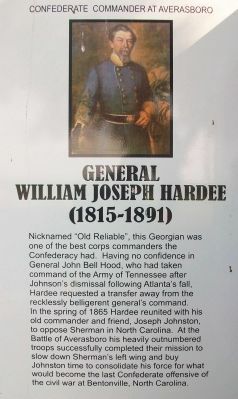 General William Joseph Hardee (1815-1891). Major-General Lafayette McLaws (1821-1897). 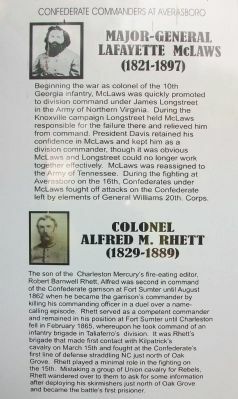 Colonel Alfred M. Rhett (1829-1889). General Joseph Eggleston Johnston (1897-1891). 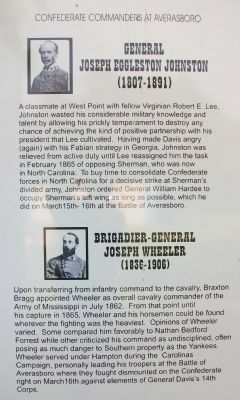 Brigadier-General Joseph Wheeler (1836-1906). Brigadier General William Booth Taliaferro (1822-1898). 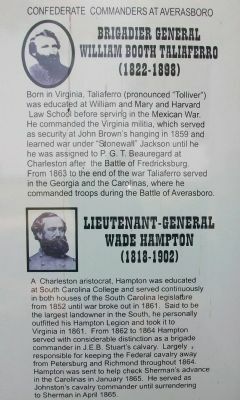 Lietenant-General Wade Hampton (1818-1902). More. 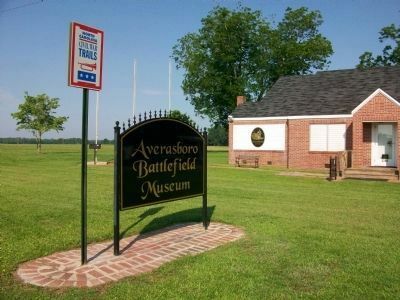 Search the internet for Averasboro Battlefield Museum. Credits. This page was last revised on June 16, 2016. This page originally submitted on June 11, 2010, by Cleo Robertson of Fort Lauderdale, Florida. This page has been viewed 1,450 times since then and 25 times this year. Photos: 1, 2, 3, 4, 5, 6, 7, 8, 9, 10, 11, 12, 13, 14, 15, 16, 17. submitted on June 11, 2010, by Cleo Robertson of Fort Lauderdale, Florida. • Craig Swain was the editor who published this page.